Yesterday Zoho introduced a unified "actionable" search. Now, maybe that doesn't sound too exciting at first, but once you start using it, you get the feeling that you typically get from Apple products.. Product managers call these features "delighters" - it's those largely unsolicited/unexpected features that give the user that special fuzzy feeling of "I didn't know I needed it, but it's so cool!" I don't know about you, but my behavior as a user of windows completely changed when they introduced system-wide indexing - now instead of trying to find that application or remember which folder i saved the file to I just type a name into the app launcher and it finds what I'm looking for! 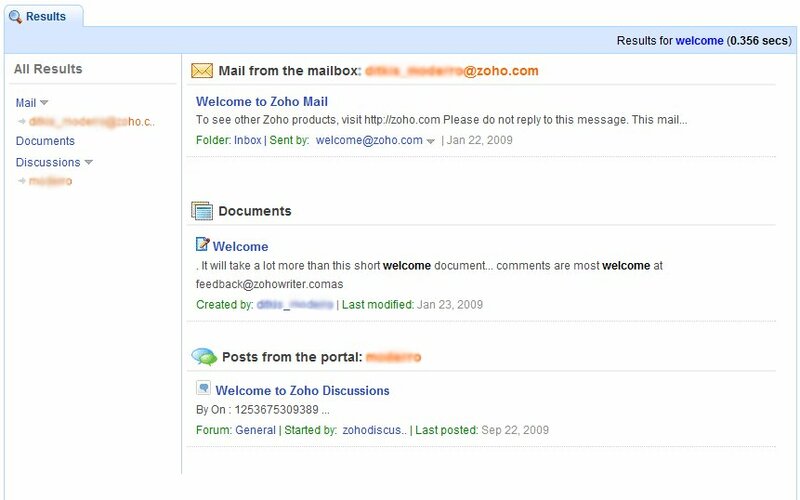 What Zoho did is an equivalent of that - it looks through all the files, emails, discussions in Zoho world and shows results. The second part of this feature is being able to do something with these results without having to open the "application" - you can reply or forward email, share a document, etc.. right from there. I've mentioned before that I like what Zoho doing and how they are doing it. They are not perfect, but they are innovating and showing their commitment to this product! And that is commendable. Not to mention that they beat Google to the punch at their own game (search).